Regardless what business you’re in, the Lean Six Sigma principles help drive real results to both, the top-line and bottom-line for companies. The same holds true for warehousing and distribution businesses. The faster you can reduce your dock to stock and stock to dock cycle time, the faster you can get the product sold and in the hands of your customers. One way to ensure that is to deploy Lean methodologies in your warehouse. Lean Warehousing will not only drive operational efficiencies, but will improve throughput and ensure quick turnaround, which is in the Warehousing and Distribution Industry. At BizWORX, our Lean Consultants have the real world experience to driving Lean Thinking throughout your warehouse. We take pride in our hands-on approach, working with all levels of the organization to drive the organizational change needed to create lasting results. When you ask our consulting team to help improve efficiencies at your warehouse or distribution facility, you can rely on them to bring years of hands-on experience in manufacturing, warehousing, and distribution to your operation from supply chain consulting to inventory and warehouse management systems. You can rely on our Lean Consultants to identify and eliminate waste in every area of your warehouse. They will help you look closely at each of the three stages of building an order – receiving, putaway/picking, and packing/shipping. They will use proven quality management systems and techniques to help you expend less human effort, reduce damages, expand capacity, and improve your responsiveness to customers. When you implement lean warehousing methodologies you will fill orders more efficiently and reduce and eliminate other forms of waste. Inventory accuracy will improve because the product is handled, moved, and counted less. Damaged and lost product will be reduced as a result of less handling. Floor and storage space will be better utilized. 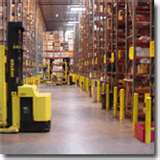 Lean Warehousing can have a significant financial impact on your business and your relationship with your customers. Lean warehouses consistently fulfill orders accurately and on time.